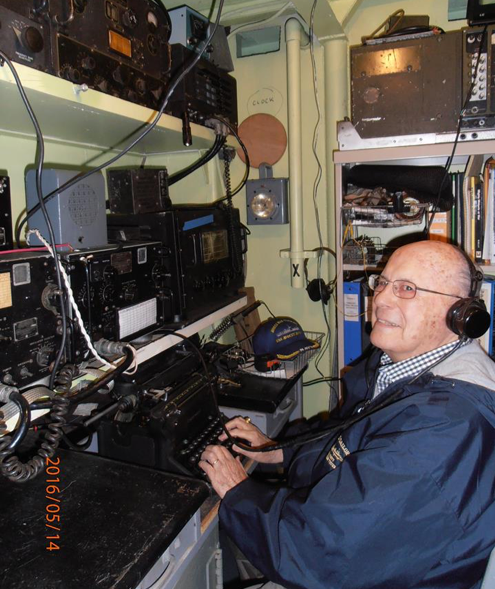 Bob Wheeler served in the USN as a Radioman 2nd Class on the USS Avocet – MHC -16, which was an AMCU and before that it was USS LCI 653. A few months ago, Bob Wheeler, visited the LCI 713 in Portland and this is his story. On February 23, 1945, the Marines raised the flag on Mt. Suribachi, on the island of Iwo Jima. On that same morning, about 25 miles south of Manila in the Philippine Islands, the 11th Airborne Division began an operation about which Army Chief of Staff General Colin Powell proclaimed, in 1993, “I doubt that any airborne unit in the world will ever be able to rival the Los Banos prison raid. It is the textbook airborne operation for all ages and all armies”. As that day dawned at Los Banos Civilian Internment Camp, it held two thousand one hundred and forty-two U.S., British, Canadian, French and other Allied civilian prisoners of the Imperial Japanese Army. After several years of imprisonment, they were the remaining survivors, who were slowly but surely going to join their predecessors in starving to death. Among the remaining survivors were my father, mother, younger brother and I. We were down to one official meal a day; living on a bug filled rice mush (mostly water) called lugau, banana tree stalks, papaya tree roots, weeds, slugs and in some cases dogs and cats. On November 19, 1945, my father, who was almost six feet tall, weighed 106 pounds; my mother, as she later recalled said, “I stopped weighing myself when I weighed 80 pounds”, weighed 92 pounds on that date; my ten-year-old younger brother weighed fifty pounds; and I myself, at twelve years of age weighed fifty-seven pounds. As we went to bed the night before, little did we know as we slept, that the men of the Reconnaissance Platoon of the 511th Parachute Infantry Regiment, with attached guerrillas, were sneaking up to their positions at key points outside the camp. Elsewhere, the troopers of the 188th Para Glider Regiment were busy keeping the Japanese troops occupied in a diversionary operation. The men of the 672nd Amphibian Tractor Battalion were making their way in the dark with hand held compasses across Lake Laguna de Bay, transporting the balance of the First Battalion of the 511th Regiment, and that “B” Company 511th with attached Medics and the light machine gun platoon from Headquarters Company First Battalion was getting a little bit of sleep at Nichols Field under the wings of the 65th Troop Carrier Squadron’s C-47s that were to carry them to their moment of history. That morning, as I walked out of the barracks with my family to line up for 7:00 AM roll call, I looked up into the sky over a field near our camp and saw several C-47 transport planes. Suddenly, the sky filled with the “Angels”, the troopers of “B” Company 511th, floating down as if from heaven in their white parachutes. At that same moment, the men of the Recon Platoon hit the guard posts and began their race to the guardroom where the off-duty guards had their rifles stored. Those guards were outside doing their regular 7:00 AM morning exercises. By the way, the troopers won the race. We all ran back into the barracks. With bullets flying just over my head through the grass mat walls, I lay on the floor under my bunk, eating my breakfast. I was so hungry that not even bullets could keep me from that pitifully meager portion of watery, buggy, rice mush. Soon, one of the “Angels” came into our barracks shouting, “Grab only what you can carry and hurry outside to the Amtracs”, those Amphibian Tractors that had brought the balance of the attacking 1st Battalion across Lake Laguna de Bay. They had to get us back safely across the lake to U.S. lines before two thousand crack Japanese troops of the infamous Tiger Division, just over the hill, found out what was going on. On that day, all 2,142 of us, including a newly born baby who was carried out in a helmet liner, were saved. ALL OF US WERE RESCUED!!! NOT ONE OF US WAS LOST!!! Sometime later, I read that they had come to get us because General Douglas MacArthur had received information, from three men who had escaped from our camp, that our guards had been making preparations to dispose of us — digging trenches for our graves and placing oil barrels which could be rolled down the hillside onto the barracks to set them afire – then machine gunning any of us who ran outside. To this day, almost seventy-two years later, this singular event of history, this magnificent military operation, this unmatched rescue of starving civilian prisoners of war from behind enemy lines has been overshadowed by the Mount Suribachi flag raising. They were and are a special breed, those men who came that day. Superbly trained – thank God – men who went home after they served – going on with their lives – not complaining – humble – proud that they served. When I have met one of my “Angels” for the first time, I have taken his hand and said, “Thank you for my life”. To a man, they have immediately insisted, “I was just doing my job. You guys were the heroes”. But for the pilots and crews of the 65th Troop Carrier Squadron, the Paratroopers of the 11th Airborne and the men of the 672nd Amphibian Tractor Battalion, I would not have survived Los Banos Internment Camp. There would have been no opportunity for me to have a wife, son, daughter, nine wonderful grandchildren and nine great-grandchildren. What remained of my bullet-riddled body would be lying at the bottom of a trench at what is now the Agricultural College of the University of the Philippines, in the town of Los Banos, The Philippines. The Wheeler Family – as it exists today – would never have been.